Let's be honest, you will probably be a girl. 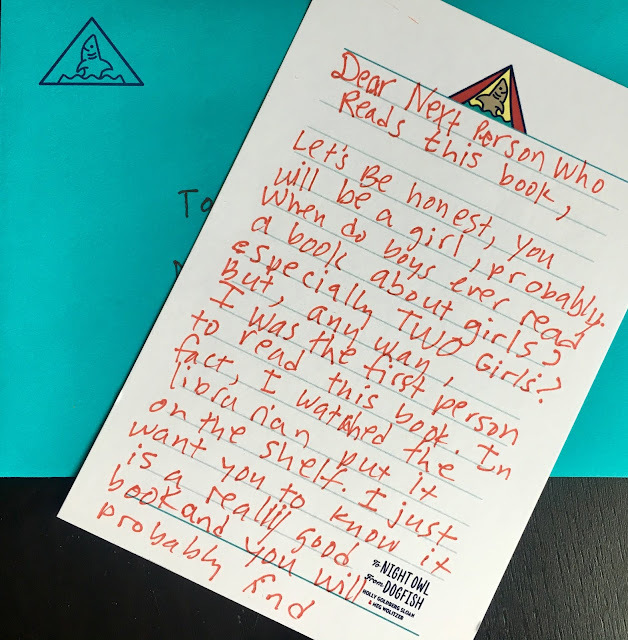 When do boys ever read a book about girls? Especially TWO girls? But anyway, I was the first person to read this book. In fact, I watched Ms. T. put it on the shelf right out of the box. 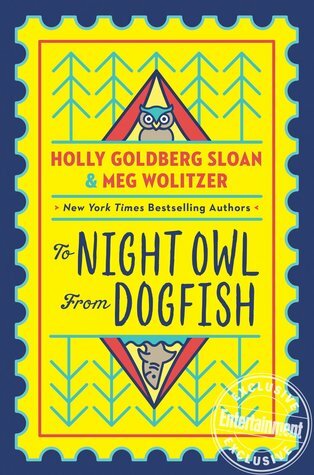 I just want you to know that this is a really good book and you will probably find that you are a Dogfish or a Night Owl. I am a Dogfish, which is Bett. I say what is on my mind and I am not scared of a lot of stuff. But my favorite animal is a Red Panda, not a dogfish, which I learned is actually a shark. I hope you like this book as much as I did, even though my dad is not gay and I don't live in a church in Venice, CA and I am not half African American and half Brazilian. What I liked is that Bett and Avery, the other girl in this book (her dad is going to marry Bett's dad and she lives in New York City) write letters to each other and they don't like each other at first but you see how they become friends. And then they become sisters. I would like that to happen to me. Thank you for your letter. It was brave of you to write it and leave it in this book without knowing who would read it and what they would think about you. 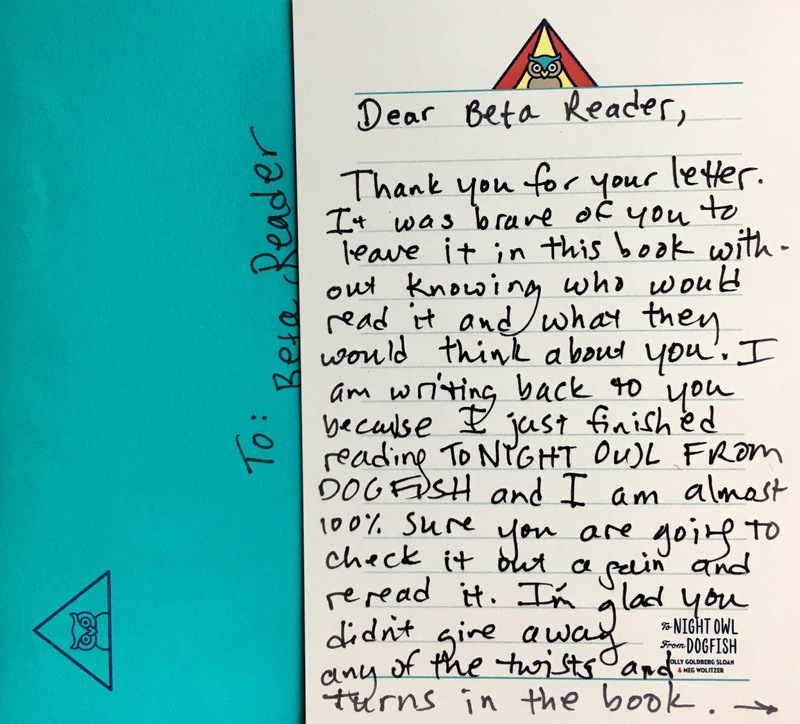 I am writing back to you because I just finished reading TO NIGHT OWL FROM DOGFISH and I am almost 100% sure you are going to check it out again and reread it. I'm glad you didn't give away any of the twist and turns in the book, of which there are quite a few. I don't have a gay dad either, in fact, my dad doesn't even live with us, but that didn't keep me from feeling like Avery and Bett were real people I could call up and talk to or text if I wanted to. I like it when a book makes me feel that way. And I liked that they talked to each other about getting your period. I haven't yet, but it is good to read about two girls talking about it helps me feel a little bit more prepared. I like it when I learn things about life from a book that they don't teach us in school. Like how being a friend isn't always easy and there are good things about being friends with someone who is different from you. You are right! I checked this book out and am reading it again! It's such a great book, even though I've never been to summer camp. CIGI sounded like a pretty cool camp, with all the science-cooking-animal-coding classes and the zip line. I don't think there is anything like that around here. And I know my mom and dad would never have enough money for me to go to a camp like that. I was surprised that Bett and Avery didn't talk to each other at camp, only by sending emails. And I definitely can't believe what Bett did on Family Day, but that is the kind of girl she is. She speaks out and connects with people. And it worked out mostly for the best. I wonder if I could ever send an email to an adult like that and change someone's life. Sometimes I feel like I'm just a kid and can't make any real difference. I believe kids CAN make a difference, just like Bett and Avery did in the book, but it's not easy. And grownups can seem so complicated and non-communicative. I know a lot of things and I wish my mom and abuela would just talk to me about them sometimes. I'm glad that Bett had her grandmother, although I still don't understand why she was called Gaga. And I'm glad that Gaga treated Avery like a granddaughter. Gaga seemed like a grownup who talked to kids in an honest way about grownup things. And she seemed kind of warm, like cinnamon hot cocoa. Maybe we should try to meet each other? 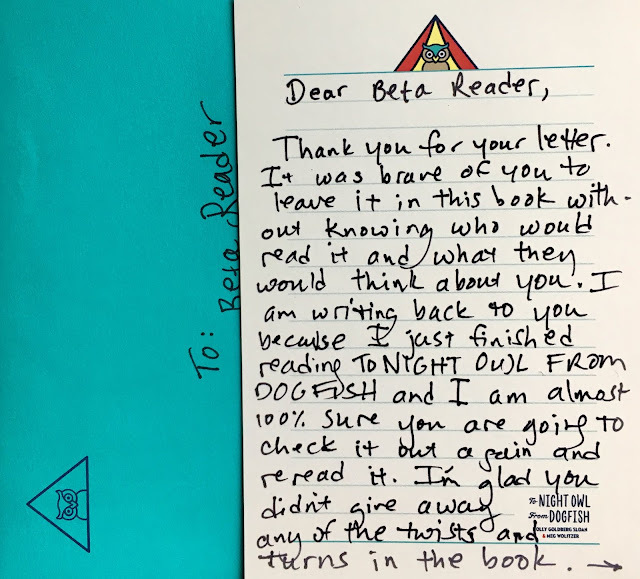 If you read this letter, leave a note with the librarian with your name and your teacher, and I will leave mine, and then she can introduce us! I wonder if we already know each other? For a traditional review of To Night Own from Dogfish, as well as a short interview with the authors, click HERE.